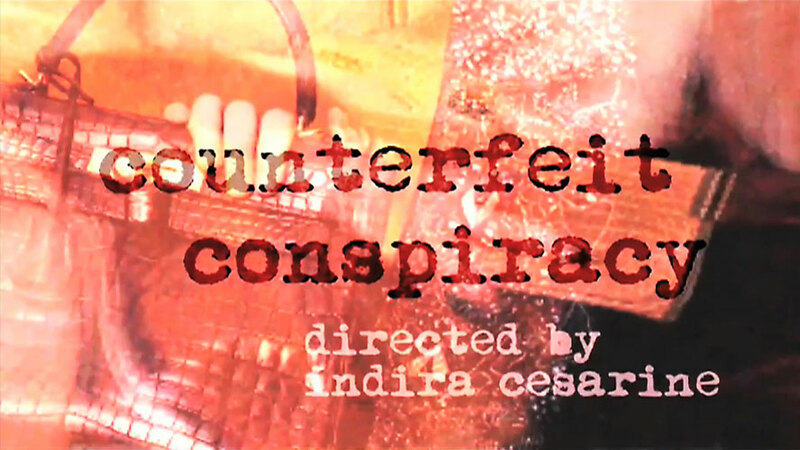 Counterfeit Conspiracy (14:07) directed by Indira Cesarine, is a 15-minute documentary exposé focusing on the controversy surrounding the sale of counterfeit luxury goods and the “links” to funding terrorism. Shot at the notorious street market Canal Street, the documentary shows original footage of the underground sales of counterfeit products, and questions why so few people are arrested for these types of crimes. Highlighting news articles that have peppered the newspapers since the September 11 attacks, Counterfeit Conspiracy brings to light the underworld that is supported by these sort of criminal activities. Edited by Randy Wells, assistant editor Kaitlyn Barlow. He is affectionately known by his first initial and last name. He is a scholar, graphic designer, filmmaker and renaissance man of all things ‘cool.’ A consummate traveler he maintains a residence both in California and New York. Over the past few years R. Wells has worked in the world of graphic design and advertising creating graphics, logotypes, videos and print campaigns for companies such as: Ecko Unltd, Cut & Sew, G-Unit Clothing, Artists and Creatives and J Brice Design International to name a few. His work has taken him around the world introducing him to creative partners famous and unknown. His reputation continues to grow faster than the universe expands. He is one of the most interesting and diverse creators in the world. Kaitlyn received her BA in Fine Studio Arts and Computer Technology from Information Guilford College in Greensboro, North Carolina in 2007. She then moved to New York City to pursue a career in photography and enroll in the Masters program in Photography and Film/Video Production at Long Island University, Brooklyn NY. Upon her arrival in New York, Kaitlyn was quickly hired by the famed photography team Markus Klinko + Indrani. While working closely with them, she has collaborated on projects including high profile clients such as Will and Jada Pickett-Smith, Padma Lakshmi, Richie Rich, Perez Hilton, Caitlin Moe, Lydia Hearst, Aubrey O’Day, Kai Kuhne and Iman. Recently, Kaitlyn also started working closely with photographer, Indira Cesarine, who is also the fashion Editor-at-Large of Lush Magazine. Kaitlyn is helping Indira as she launches her first issue of XXXX Magazine, “The Untitled Magazine”, within the year. Kaitlyn has her photography work accepted in more than 9 art shows including one juried by internationally renowned artist, Judy Chicago. She also had her first film screening in 2007 when her short documentary “Inner Freak” was premiered at the Big Mini DV Festival in Brooklyn, NY. Kaitlyn is also a co-founder of BadAss Productions, a pro-active creative team based out of New York City as photographer, Art director, photo retoucher and Video/Film production artist.